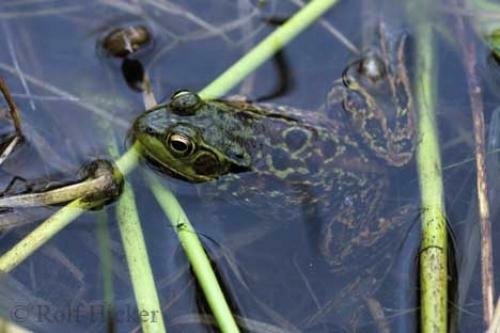 The Mink Frog is one of seven species of frogs found in the Kejimkujik National Park of Nova Scotia, this frog was found bathing in the Mersey River. The Mink Frog prefers quiet waters with plenty of plants to hide amongst. This Mink frog was found in the Mersey River of the Kejimkujik National Park in Nova Scotia, Canada. Identified by its green and brown colouring, the Mink Frog emits a mink odour, or the smell of rotten onions when handled. Pictures from photo gallery "Nova Scotia Pictures"
This picture is part of the photo album "Nova Scotia Pictures" - there are more beautiful images waiting for you.